Now available from our online gallery store: individually hand-signed, numbered, and framed limited edition prints. Perfect for gift-giving and available at reasonable prices. Please browse our online gallery store by following the links above. Purchasing one of the fine limited edition prints is easy: your order will be shipped upon receipt and processing of your check (drawn on U.S. banks only, please) or processing of your credit card transaction. All prints are individually numbered and hand-signed and framed in a versatile European-style frame, and shipped by Priority Mail within the United States, with optional Express or International shipping at additional cost. Not yet a PayPal customer? Sign up--for free!!!--today. Light and imagination fuel the exquisite rendered artwork created by Cathy Faye Rudolph. Her stunning and fanciful work can be seen in the video Planetary Traveler, currently in release from Third Planet Entertainment. Ms. Rudolph was one of seven artists who created the worlds of Planetary Traveler and the creator of the signature Mothership that graces the video's cover. The premiere exhibition of her still images was held August 5-8, 1998 at the 56th World Science Fiction Convention in Baltimore, Maryland, where her evocative trilogy Skipping Stones at Morning, Noon, and Evening captured the art show's Popular Choice award. In 1999, her picture 'Not The Be5: It's Just A TV Show,' a tongue-in-cheek homage to the show "Babylon 5" and the actors' extracurricular music CD "The Be 5," won 1st Place in the Media division at ShoreLeave 21 Art Show in Hunt Valley, Maryland. Cathy Faye Rudolph is the owner of Wayward Fluffy Publications, a company that specializes in web site design and content management. 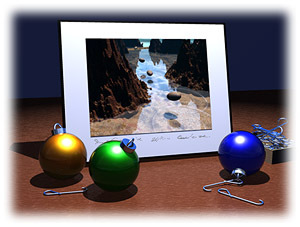 Cathy's award-winning 3D rendered artworks are frequently integral to client web site design and promotions, and are often sought as photo-realistic substitutes for expensive or impossible photography.